Before we start talking about her writing, I want to thank Elizabeth for joining us today and telling us a little about herself and her new YA dystopian release! Welcome, Elizabeth! About 5 years ago, when I was 49, our family was going through a financial crisis (which happened to coincide nicely with the whole economic meltdown). I have always been a frustrated performing artist and sought some way to express my creativity – thinking I might be able to do something to generate a little money. Once I started writing, I stopped caring about whether it would sell or not. It became a therapeutic compulsion for me. My first two books are Women’s Fiction/memoir and my most recent is a young adult dystopian tale. The “aha” moments when something truly unique, moving and/or striking comes out of my imagination. Not sure what creates those inspired moments, but when they happen, it’s like an epiphany. The business end. Querying for agents/publishers, marketing, editing, revising, cutting! The first two books were from my life experience. The second was an idea suggested by my daughter. She really wanted me to write a children’s book, but once I got started, it quickly morphed into a twisted scifi genre. I still maintained the integrity however, of her original idea. I would have to say my voice. I’ve heard this from readers all around the world. YES! When you do read someone else’s writing, what is your favorite genre? Oh I’m so fickle! I waffle between classics, women’s fiction, memoirs, and young adult adventure and scifi. The third and most recent book I’ve been referring to is called “Ima Pigg”. While my target audience was young adults—the same readers who love “Twilight”, “The Hunger Games” and “Unwind”—I’ve had many adults respond very enthusiastically. It’s already affectionately been called a cross between “Charlotte’s Web” and “Invasion of the Body Snatchers”. 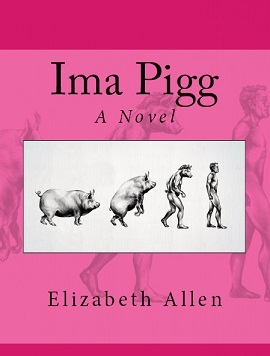 “Ima Pigg” is a story about animals and humans – and their place on the food menu. Imagine a world in which being a vegetarian and a defender of animal rights might turn you into a traitor in the government’s eye. Imagine a world in which meat is eaten for breakfast, lunch, snacks and dinner and a world in which the growing of vegetables is quite a serious crime. This is the world of Ima Pigg. It is also a world in which certain people have the ability to speak with animals and it is a world in which transfurmations (“fur” is not a spelling mistake) occur. Some animals have the ability to switch places with humans: they can take over a human body and the human’s soul will in turn take over the animal’s body. This book tells the story of some of those animals and people – and their plan to make the world a better and less cruel place for animals. At present, “Ima Pigg” is out on Kindle and the paperback will be out before the end of summer! BE SURE TO COME BACK to read more about Elizabeth and her novel, IMA PIGG, on Wednesday’s Karen’s Killer Book Bench!! Happy Reading!